CW4 Deanna I. Merriman was born in Minot, ND and came into the military in August 1993. 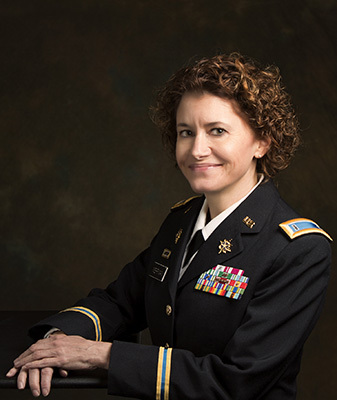 She enlisted as an accounting technician and served in that role for seven years prior to joining the Defense Attache System (DAS) as an Operations NCO. Upon completion of her first DAS tour in Amman, Jordan she was selected for Warrant Officer Candidate School (WOCS) in October 2002. After completion of WOCS, where she graduated the Distinguished Honor Graduate and set the APFT record, she was assigned to Rangoon Burma. She served as the Operations Coordinator (OPSCO) from August 2003 to June 2006. During this tour CW4 Merriman turned a poorly performing station that had recently failed an IG inspection into a model office. Due to her leadership USDAO Rangoon received a commendable on their IG follow-up, the first commendable given in the DAS in 20 years and the last to date. She then completed a permanent change of station to US Embassy Kyiv, Ukraine and served as the OPSCO from June 2006 to June 2008. In Kyiv she supervised four NCOs and ten locally engaged staff. CW4 Merriman organized the logistical and program requirements for a revolving door of distinguished visitors to include POTUS, SECSTATE, and SECDEF. She received countless letters of commendation for her excellence. Following her tour in Kyiv she was assigned as the OPSCO to US Embassy Nairobi, Kenya, the largest embassy in Africa from June 2008 to June 2010. USDAO Nairobi excelled under her leadership and during a routine staff assistance visit was deemed a model DAO and the best in the DAS. She was vital to the successful implementation of the Senior Defense Official/Defense Attache program set forth by the Office of the Secretary of Defense. Next, she was assigned as the OPSCO to USDAO Paris France. Paris is one of the largest and most visible of all Defense Attache Offices in the world. She supervised four service members, one DoD civilian, seven locally engaged staff and oversaw all resources of the DAO. Under her management, USDAO Paris coordinated and executed a record number of information reports and senior DoD official visits, including POTUS, VPOTUS, SECDEF, and SECSTATE. CW4 Merriman was a valued member of the Country Team, superbly representing all DoD interest on the housing board, awards board, and ICASS Budget Committee. During annual D-Day commemoration ceremonies she confidently assumed her place among General Officers, carefully laying wreaths on behalf of the US Ambassador. CW4 Merriman’s culminated as an instructor for the Joint Military Attache School. She was the first female instructor in 20 years and served as a mentor to the next generation of attaches, OPSCOs, and OPSNCOs. CW4 Merriman has a Bachelor of Science in Business Administration and a Master’s of Management. Her military education consists of, the Action Officer Development Course, Warrant Officer Advanced Course, Warrant Officer Basic Course, Warrant Officer Candidate School) Distinguished Honor Graduate), Basic Noncommissioned Officer Course (Commandant’s list), Attache Staff Operations Course (Honor Graduate), Primary Leadership Development Course (Honor Graduate), Travel and Entitlements Course (Distinguished Honor Graduate), Combat Lifesaver Course. She was also a three time select on the All Army Marathon Team, and a two time select on the US Army Europe 10 Miler Team. Her awards are as follows: DMSM-6, JSCM-1, MSM-1, ARCOM-1, JSAM-1, AAM-2, JMUA-3, AGCM-3, NDSM-2, GWOTE-1, GWOTS-1, KDSM-1, NOPDR-2, ASR-1, OSR-6. She has two children, daughter Courtney age 20 and son, Seth, age 17. Both children are in the process of enlisting in the USAF.